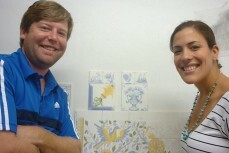 Tiles: tour & painting workshop » Lisbon stories - belong to the city! Did you know that “azulejo” means painted stone in Arabic? Tiles were brought to Portugal by the Arabs and immediately integrated into our culture and architecture. Especially important when rebuilding the city after the 1755 Earthquake, tiles can be found everywhere and in every single style. Find the most beautiful examples of tiles, both old and modern, spread throughout the city. Learn what their use has been over time. Understand why are them such a vulnerable art piece. 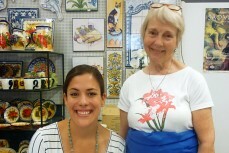 Get inspired by the most unique designs and then get your hand to work: paint your own tile! 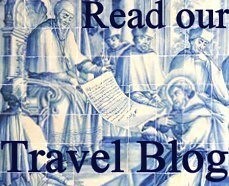 You’ll be taken on a special walking tour of Lisbon, covering classic sites and finding special tiles. 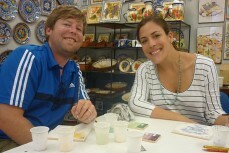 The walk will end in Alfama, in a special tile shop, where you can paint your very own tile. Upon your arrival, a resident artist will be waiting to assist you and will walk you through the process. Even if you don’t consider yourself an artist, I promise you’ll be pleasantly surprised with the result. In the pictures you can see Rose and Craig during their tour. They asked me to create it as a customised tour but it turned out to be so interesting that I decided to include it in the tours list. Thanks for the great idea! Difficulty level - medium - walking tour. 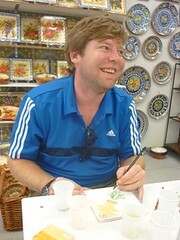 You will be taken on a 3hours (can be shortened) walking tour after which you’ll be able to paint your tile. During the workshop you can paint your own pattern or copy one of the available templates. There will be someone happy to help you during the different phases of the workshop.